The Takeway T1 clampod weighs just 200g, yet the maximum load capacity of the clamp body is 40kg. The Clampod is made of aerospace grade aluminium alloy, making it both lighter and also stronger than many other products. It is supplied complete with a ball head that has a maximum load capacity of 3kg – users can also install a ball head of a higher grade for higher load capacity. The T1 Clampod can be clamped at any angle and also stands by itself. It can be used in many different places and allows you to take a unique selfie in any location. The T1 can conform to almost any surface, from a tree branch to a motorcycle, thanks to the high precision mechanical hook that grabs hold of the most diverse surfaces. 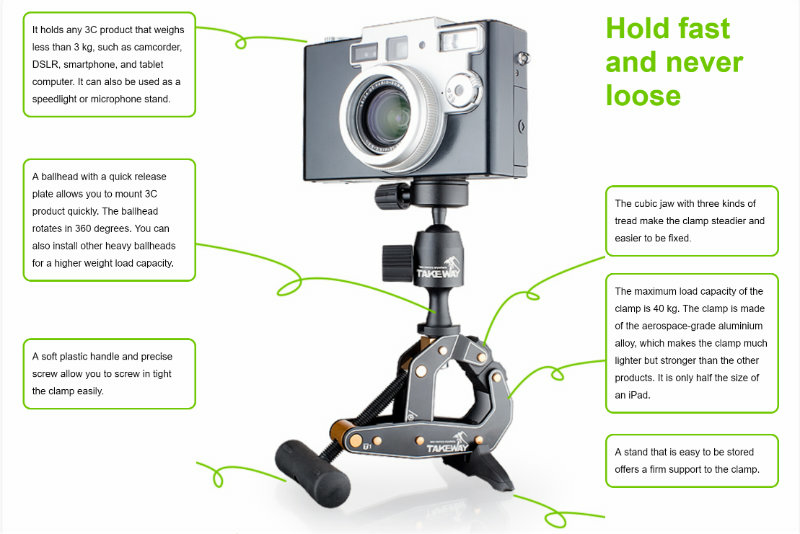 Ideal for use with Brinno time lapse cameras, phones, tablets and most other DSLR and compact cameras. Click the button below to add the Takeway T1 Clampod to your wish list.